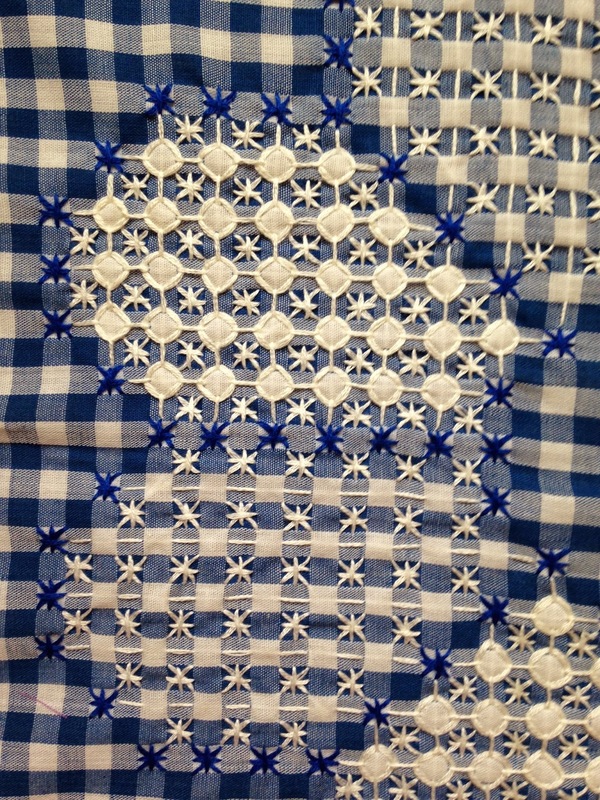 Over the weekend I went to my first Illinois quilt retreat at Stronghold Camp. It is a Presbyterian Church Camp that has some interesting history to it and some pretty nice facilities too. We had hotel style rooms to stay in; nothing fancy but really, how much time do you spend in your room at a quilt retreat? I've always come home pretty sleep deprived from retreats so that doesn't leave much time for sleeping. Besides I can sleep at home; I cant always quilt for myself at home. Our workspace was a bit crowded though. We shared a 6' table with another person. We didn't have design walls, or cutting stations at the appropriate height or ironing boards at the appropriate height but I don't think it slowed any of us down too much. I'll show you a few of the things I got finished. I haven't photographed everything yet. Remember we were a bit crowded so not much room to photograph completed progress at the retreat. I had to wait until I was home and I haven't taken all the photos yet. This little quilt is only 13" x 17". I've had it pieced for quite some time (like 2 years ago). It was my first Little Jo's Club project. I decided to just quilt it on my domestic machine with straight lines. I'm not sure I'm 100% happy with it but it's a finished Flimsy. 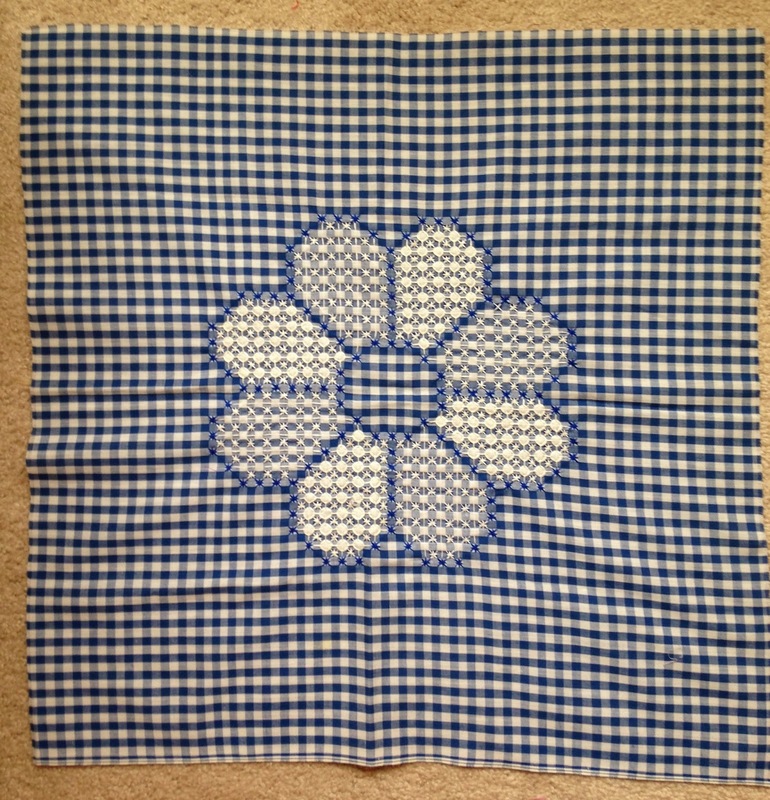 I pieced this quilt top from the Little Jo's Club (again a long time ago). 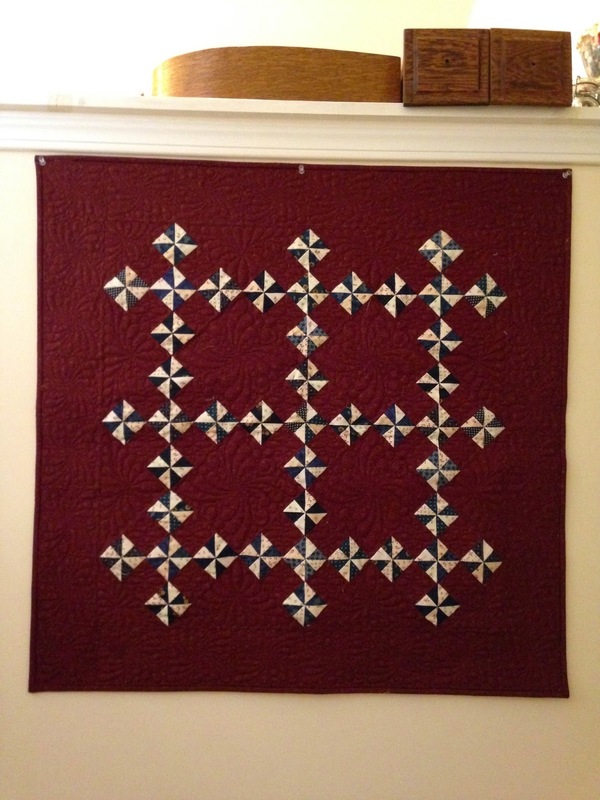 I decided to quilt it the day before I left for retreat so I could bind it at the retreat. Another Flimsy finished! Whoo Hoo! And I've already hung it up in the stairwell going up to my studio. Ooops! Two steps forward, one step back. I created another Flimsy. I appliqued this at retreat. 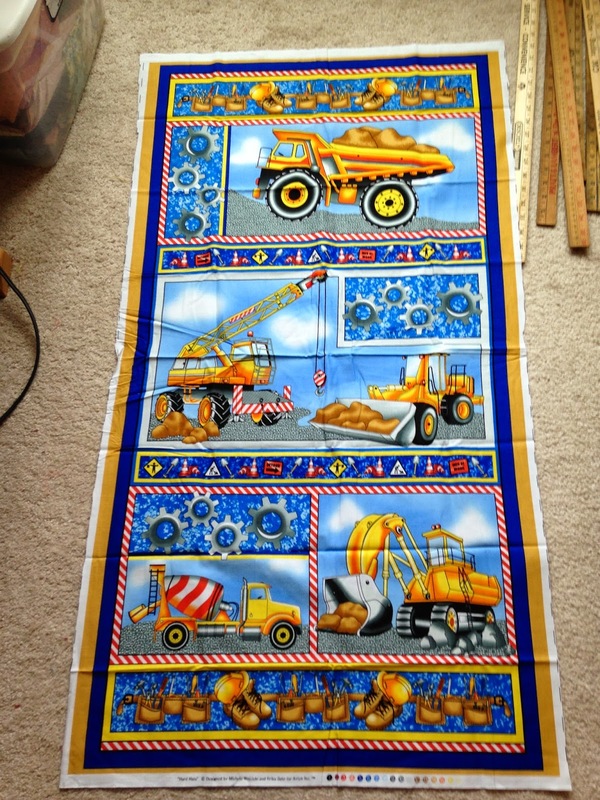 Now before you're too impressed, it was a pre-cut, pre-fused kit and it's only 12" x 18". I laid it out without a design sheet. Apparently you have to purchase a book to get the layout guide. I just winged it from the tiny 1" photo on the package. It's suppose to be a block of the month but I only wanted this one for a wall hanging. 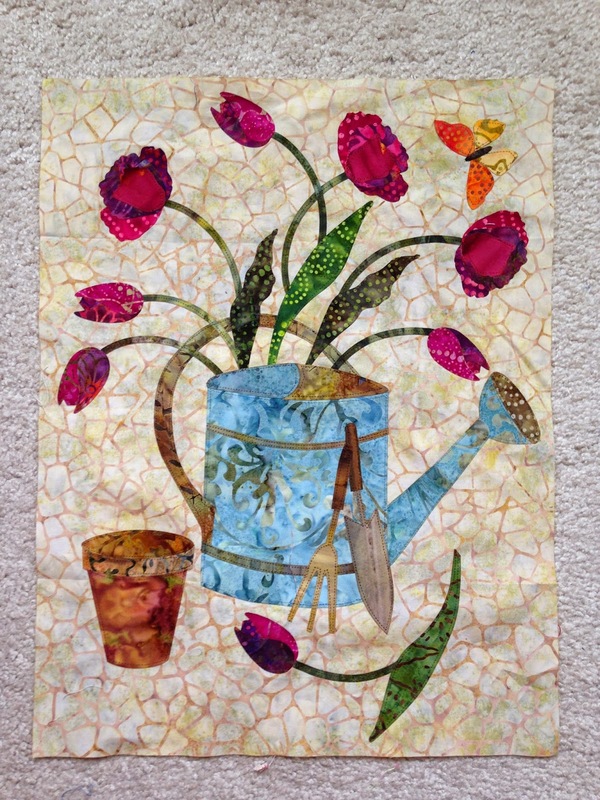 I'll add a border the color of the watering can and then quilt it... someday. And no retreat is complete without a shopping trip to the local quilt shop. I picked up these "Chicken Scratch" pieces at Stitches in Time in Oregon IL. I only paid $2 for them. I just couldn't pass them up. I don't know what I'm going to do with them but I bet you'll see them again someday. And a certain little boy I know will love this panel in a quilt. Another bargain! And just because it was $2 off per yard and then she gave us an additional 20% off because we were retreaters. What a deal! I also finished 12 Farmer's Wives blocks, put a binding on a top secret quilt, and completed a scrappy UFO at the Stronghold Quilt Retreat. I'll share those with you on Wednesday. Tomorrow is Tips, Tricks, and Tuts Tuesday.